Prince William and Duchess Catherine of Cambridge will make an official visit to Sweden and Norway. According to the programme, the state visit starts on January 30 and ends on February 2, 2018. All details about the Sweden and Norway tour shared today. Their children - unlike in previous tours - will not be accompanying them. Visiting Program (Sweden): Day one of the tour will begin on Tuesday morning in Stockholm, at a bandy hockey event at Vasaparken, an outdoor ice-skating venue in the centre of Stockholm. The Duke and Duchess will arrive at the rink from the Residence of the British Ambassador to Sweden, where Their Royal Highnesses will have stayed the night before. The Duke and Duchess will meet a group of local bandy players on the ice, and learn more about the sport and its popularity in Sweden. Next, The Duke and Duchess will travel to the Royal Palace of Stockholm to attend a luncheon hosted by King Carl XVI Gustaf and Queen Silvia to welcome Their Royal Highnesses to Sweden. Approximately fifteen members of the Swedish Royal Court will attend the luncheon, including Crown Princess Victoria and Prince Daniel. Following the luncheon, The Duke and Duchess, accompanied by Crown Princess Victoria and Prince Daniel, will walk through the picturesque cobbled streets of Stockholm from the Royal Palace to the Nobel Museum. During this walk, Their Royal Highnesses will have an opportunity to meet members of the Swedish public that will have assembled in Stortorget, the oldest square in Stockholm, and a charming public space outside the Nobel Museum. Once inside the Museum, Their Royal Highnesses will meet a number of Nobel Laureates, and will hear more from the Museum's curator about Science in Sweden and the Nobel Laureate system. From the Nobel Museum, The Duke and Duchess will travel to Ark Des, Sweden’s national centre for architecture and design. Here, Their Royal Highnesses will attend an event celebrating architectural collaboration and the best of Swedish design, from the most iconic and global furniture brands, to up-and-coming homeware designers with new takes on sustainable furnishings. That evening, The Duke and Duchess will attend a black tie dinner at the Residence of the British Ambassador, attended by members of the Swedish Royal Family, and representatives from government, and popular culture, including Prime Minister Stefan Löfven, and actors Stellan Skarsgård and Alicia Vikander. The morning of Day two will focus on Sweden's pioneering work in the field of mental health and children's wellbeing, and in particular how this translates into support for children and young teenagers going through the Swedish education system. Their Royal Highnesses, accompanied by Crown Princess Victoria and Prince Daniel, will begin the morning at the world famous Karolinska Institute, which accounts for over 40 per cent of the medical academic research conducted in Sweden. The Duke and Duchess will meet with leading scientific researchers and practitioners to discuss ground-breaking academic work in developmental psychology, and Sweden’s approach to managing mental health challenges, including the impact of physical activity on mental health. 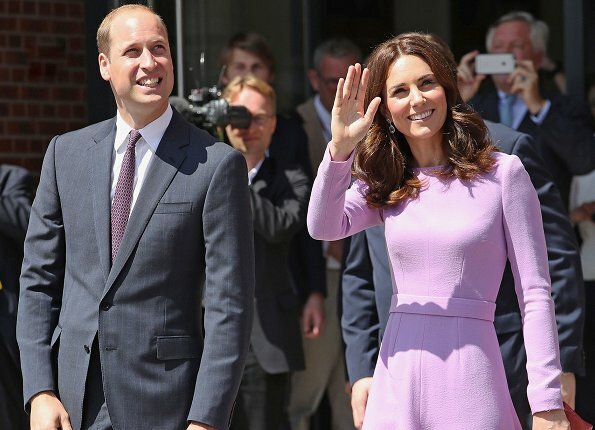 Their Royal Highnesses will also hear about the Youth Aware of Mental Health (YAM) programme run by the National Association for Suicide Research and Prevention of Mental Ill Health (NASP). YAM is a programme run for 14 – 16 year olds promoting increased knowledge about mental health through dialogue and role-play, and now operates internationally, including in the UK. The Duke and Duchess and Crown Princess Victoria and Prince Daniel will then head to Matteusskolan, a comprehensive school in the heart of the city centre. Their Royal Highnesses will join children who have taken part in the YAM programme during one of their mental health activity sessions, and will speak to the mentors who run the training. That afternoon, the two Royal couples will visit one of Sweden's leading department stores – NK – to open an interactive exhibition of UK design, fashion and brands that operate in Sweden. The Duke and Duchess will learn how these brands in particular put innovation, technology and sustainable practices at the forefront of their businesses. The event will take place in NK's entrance hall, and for the duration of the exhibition the best of British brands will feature in the display windows of the store. From NK, Their Royal Highnesses will travel to Haga Palace, Crown Princess Victoria and Prince Daniel's official residence, for a private tea with the Royal couple. On their last evening in Stockholm, The Duke and Duchess will attend an event at the Fotografiska Gallery, which at night boasts glittering views over Stockholm. The event will be a celebration of contemporary culture with guests representing the worlds of music, film, television, theatre, tech, dance, art and sport, with live music, drinks and canapés. The Duke will also deliver a speech at this event. Weather permitting, Their Royal Highnesses will travel to Fotografiska by boat, allowing The Duke and Duchess to take in the views of Stockholm by night as they pass around the harbour. Prior to joining the reception, the Royal couple will have a short tour of the gallery's latest exhibition by UK photographer Nick Veasey. The following morning, Their Royal Highnesses will depart Sweden for Norway from Uppsala Airbase. Prior to their departure, The Duke and Duchess will receive a short briefing on the Swedish Armed Forces' operational capabilities, before viewing some of the Gripen aircraft of the type deployed by Sweden as its commitment to the Joint Expeditionary Force. Visiting Program (Norway): The Duke and Duchess will land in Norway at Oslo Gardermoen Airport in the late morning, where they will be met by Crown Prince Haakon and Crown Princess Mette-Marit. From there, Their Royal Highnesses will travel directly to the Royal Palace, where The Duke and Duchess will stay at the invitation of King Harald and Queen Sonja. Prince Willian is, no doubt, an excelent person, but as to looking wonderful i beg to dissent. They should be grateful for the receptions they will be receiving in Sweden as the British Royal Family have shunned the Swedes for a very long time. I guess the Swedes are taking the high road and will be very welcoming hosts. I remember the Prince of Wales and Duchess of Cornwall visiting soon after Estelle's birth because Victoria wore a lovely green dress. (Sorry fashion in all things, HA!) The Wessex pair have represented the British well in Sweden. I believe this is genuine interest and preparation as we sometimes overlook the 3 generations. The Cambridges are grandchildren of the Queen and her children represent her through their official visits and their attendence to events representing their country on behalf of their mother. Merely my weak observation as I am usually observing what Sophie, Catherine, and Camilla are wearing but aren't we all!?! I actually agree with ATL. The British royals have snubbed the Swedish for years. A few examples I've noticed. Last year William attended a tech conference in Finland. There was a photo posted on Kensington Palaces twitter page that showed William standing and talking to Prince Daniel who also attended, Al Gore and another male, correct me if I'm wrong but I believe it was Crown Prince Haakon. KP failed to mention Daniel in the tweet. People online noticed it. Also last year when Sweden was attacked, every other royal country sent condolences to King Carl Gustaf except the UK although every time they have an attack King Carl Gustaf is one of the first to send his regards to them. The only reason why they send Sophie and Edward is because they aren't high up on the royal totem pole and it would look rude not to have someone from the UK representing at foreign royal events. But, in general the Brits think they're better than other royal families. I agree that the Swedish royal family will be gracious and hospitable to W&K, because Victoria is a very friendly and nice person but i hope they won't fawn over them like other host countries do when they visit. Like Luxembourg did when Stephanie basically started acting like a clone of Kate's. There's lots of excitement surrounding them wherever they visit but, it's all hype to me. They're the most mainstream royal family but, if people knew more about the others then I honestly believe they wouldn't be as popular. So William stands chatting perfectly amicably to Daniel - but the royals snubbed the Swedes? No, the KP machinery cocked up. The British sent condolences- one of the victims was British. Edward is the son of the reigning monarch - hardly a nobody. Charles and Camilla have attended events. An awful lot is said about how the British Royal family thinks they're better than other royal families. It's a perception from onlookers which obviously the BRF must take some responsibility for. But basically, all the other families attend events in the UK - private relationships are fine, some closer than others. I think the real issue is the BRF still operates in an old-fashioned way following the old never complain, never explain adage - so they are their own worst enemies when it comes to correcting outside perceptions. They do things differently but I think other monarchs know that's just how they do things and accept it. Privately Queen Elizabeth is quite close to the Danish Queen, Princess Beatrix and Constantine and Anne-Marie. She was also close to the last Norwegian king. I have no idea what private relations are like with the Swedish royals (personally, I have little time for the King) but I really think this idea of superiority is overstated. I don't think they sit around saying we're better than those others, let's ignore them - the most senior members of the family are elderly and the younger members have only recently become "full-time". It makes sense to me that Edward and Sophie have done a lot of the work not done by Charles and Camilla. Anne works incredibly hard but it's quite low-key (and she's actually lower down the totem pole than Edward) - and the Duke of York shouldn't be allowed out without a minder. Until relatively recently there wasn't really anybody else available. That said, I think William and Catherine and Harry and Meghan will need to start forging closer links with overseas royals - the blood ties are becoming less binding with each generation. At least the Cambridges have realised how utterly shocking their own linguistic abilities are and are trying to do something about it for their children. And Prince Philip was neither here nor there in royal pecking orders and is closely related to many royals in Europe - with whom he maintains contact. If people want to assume some innate snobbery on the part of the BRF then fine but "shun" is incorrect - that would imply no contact - and no invitations to birthday and anniversary celebrations. Thanks you both for your insight. I appreciate it.I always thought the choice was Edward and Sophie because they are not divorced😯 I might be slightly naive! Well, it could be the fact that they seem a stable couple as Well! 🙂 Also, when they had to give up their "outside" jobs then obviously a role needed to be found for them - and none of the younger royals were ready. I think they do a good job. Anyway, it's really just my perception - I'm in the UK. Don't know where you are based Liza - definitely agree the (English speaking) media are quite singleminded about covering the BRF. Like most people on here I guess I've become quite adept at looking elsewhere to get my other royal families info. The Internet has definitely made it easier. The tweet was odd. I wish I could go back and find it, but it was just a strange oversight to make. Mistake, yes maybe but the BRF act like they're the only royal family that exist sometimes. Edward may be the Queens son, but he still isn't that high up on the totem pole and definitely not seen as a "senior royal" but more of a person sent whenever a representative needs to be present at a foreign event. He and Sophie are basically just glorified ribbon cutters. Queen Elizabeth herself did not send condolences but the mayor of London did. King Carl Gustaf although not my favorite either always sends his regards to the UK. Stated before every other European head of state (King or Queen) sent their condolences to Sweden. How hard would it have been for the Queen to have a message sent from her office? She did to other royal countries who also were attacked. Everyone acts like William, Kate, Harry and his fiancee will be the saviors of the BRF. But they're much more of the problem than the solution. I think when that sad day comes and the Queen is gone that family will go into disarray. The older royals are ready to retire and the younger generation aren't ready to step up. I do agree with you though Franny that a lot of the negative opinions about the BRF is because of too much tradition and their unwillingness to change. If they don't stop with their rules and protocol it will soon be too late. No maybe they aren't shunning other countries intentionally, of course they have to invite them to weddings, birthdays, etc.. It's tradition, but I don't think they're trying to be friendly either. I think Edward and Sofia have done a good job representing The Queen. They are very good with people and they always look genuine so interested and amiable with Scandinavian royals. I think this feeling is shared with all those persons themselves. Look any pic when they meet or talk. But I think it is also high time W & C start to make their own network. Interesting program. I'm sure Madeleine will decide to grace everyone with her presence. She won't miss a chance to be seen with W&K. No way she's going to pass up such a high publicity event. On the flip side: Two royals' maternity looks for evening and day wear? Count me in! I would be so happy if Madeleine attended these events. It would be great to see all the swedish princesses together with Kate but I have a feeling Madeleine won't be there. Anyway, it would be really cool to see them all together! Looks like a busy schedule. I think these official visits are highly needed, William & Catherine need to get closer with the other coming to be kings and queens. It may be very lonely job if you do not have good network wit other couples in same situation. Maybe they go to participate with the group of heir apparent couples of Europe group what is having meetings every year. Looking forward to it. Guess it's going to be great.